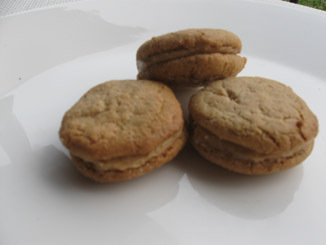 Below is a recipe inspired by the Do-si-dos, Peanut Butter Sandwich Girl Scout Cookies. Here natural peanut butter is used, made only from peanuts! Conventional peanut butters contain sugar, hydrogenated oils and a long list of unnecessary ingredients. Other nut or seed butters may be used, like almond butter or sesame tahini, for delicious variations. Preheat oven to 350oF. In a blender, food processor or spice mill, grind the oats into a coarse flour. Mix together rice flour, 2 cups of oat flour, baking powder, baking soda and xanthan gum and set aside. In a small bowl beat the starch, tapioca, cream of tartar with 6 tablespoons of water. 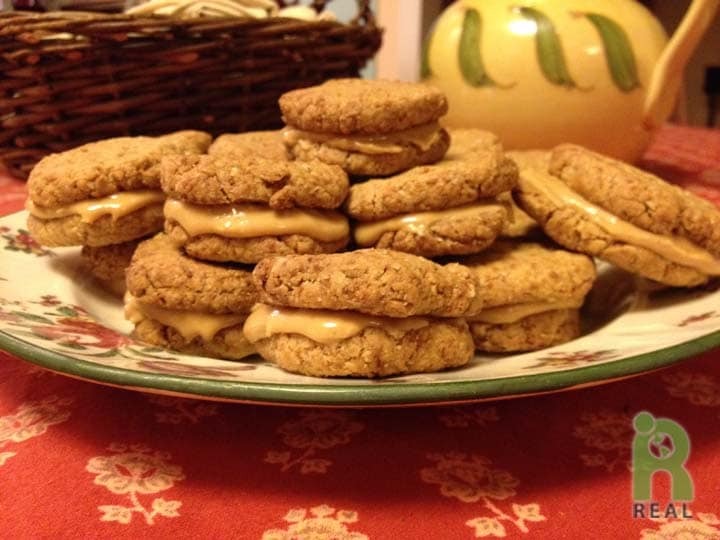 Combine peanut butter and oil or shortening in a large mixing bowl or stand mixer. Add brown and white sugars. Beat until creamy. Add starch mixture and vanilla to the peanut butter batter. By hand or with a stand mixer, slowly beat in flour mixture. Add remaining oats and mix until just combined. Drop cookie dough by the tablespoon on a large cookie sheet lined with parchment paper, keeping cookies about 2 inches apart. For a more uniform shape, form the dough into a 2 inch wide log and slice into equal size 1/4 inch wide piece. Roll each piece into a small circle and place on baking sheet. Bake for 10 – 12 minutes, remove from oven. 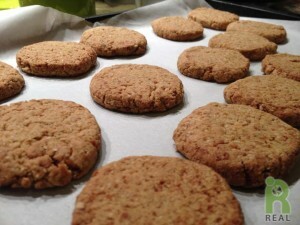 Flatten the tops of cookies slightly with a spatula and let cool. For the cream filling, mix together peanut butter and powdered sugar to make a stiff dough. With hands, roll dough into small circles and press onto cookies. For a creamier filling, or if the dough is too crumbly, use shortening or oil. When using shortening, the texture will remain as a dough that you can roll into a flat circle and place between two cookies. When using oil, the filling will be a little looser. It can still be rolled but it will be sticky to handle and better if spread on the cookies with a knife. Makes about 48 sandwich cookies.